What price a basket of prized wild fungi? Well, for the biggest and the best porcini or truffles, a great deal of money. Unfortunately, this year’s season began with a number of hunters, 18 by some estimates, paying too high a price and losing their lives while negotiating the woodlands that nurture these edible jewels of the Italian table. Competition has never been fiercer, with some heading out in the dead of night in order to throw rivals off the trail. Reduced visibility combined with summer rains that have made certain areas treacherous under foot are the underlying causes of these tragedies. Ironically it is these very summer rains that have led many experts to predict 2010 will be a bumper year. While the death toll has raised awareness in Italy of the importance of placing personal safety above profit or pride, it is unlikely to deter the thousands who every year search between the first leaves of autumn for these earthly treasures. Indeed, the image of the mushroom hunter heading off into the hills through the mist of early morning is one of the most romantic of culinary images in southern Europe. It speaks of a time far removed from pre-packaged food, supermarket chains, and those small packets of dried porcini to be found in delicatessens the world over. The most famous of fungi, in part because of the price they fetch, are the white truffles that grow in the woodland surrounding the town of Alba, in the north-west region of Piedmont. The best examples have exchanged hands for hundreds of thousands of dollars. The town itself hosts an annual international festival dedicated to their incomparable aroma and taste – this year it runs from October 9 – November 14. Alba is the capital of the area known as Le Langhe, famous for the municipalities that produce Barolo and Barbaresco wines – so you won’t want for a robust red to accompany a porcini ragù. Truffle hunters are usually accompanied by their trusty dog, trained to identify individual tubers. In fact, it is not unfair to say that a successful hunter is only as good as his dog, a maxim sadly reflected in the fact that it has not been unknown for the most unscrupulous to poison a rival’s animal in order to gain an advantage. While the Italian government is powerless to prevent these petty and vindictive acts of cruelty, it has recognised the importance of sustainability through a series of regulations that cover the weight of fungi that one person can pick on any given day and forbid methods of collection that damage the landscape. The system is policed through the issuing of mandatory permits that must be applied for on an individual basis. 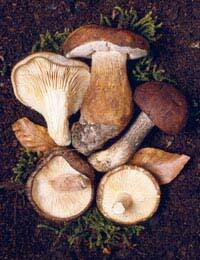 This legislation is designed in part to protect the public, since along with the porcini and chanterelle to be found on the forest floor, there are fungi of the toxic variety that can easily be mistaken by the untrained eye for an edible species. A fail safe for those unsure as to what they have in their basket is to take it to a farmacia, or chemist’s, where the catch can be inspected. For those Italians who have difficulty accessing the countryside, or who would much rather stay in bed on a misty autumnal morning, there is always the option of heading down to the local market, where wild mushrooms can be purchased, ready to be cleaned with a small brush before stealing the limelight in an antipasto, rice or pasta course.